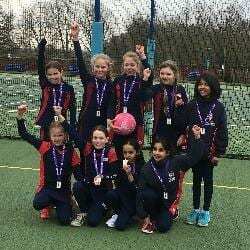 Last week our girls became the IAPS National Small Schools Netball Champions. They played some incredible netball throughout the day and after winning their pool, they progressed to the quarter finals, beating Longacre 8 – 2. The semi-finals were a challenging match going down to a golden goal. The girls won 3 – 2 with a calm and collected shot from Goal Shooter Meeka to secure the win. The final saw them up against another local Berkshire school, Dolphin. The girls really showed the netball they were capable of in the final and displayed incredible determination and teamwork to secure a 10 – 1 win. Well done St George’s!